Beautiful area in Valencia Northbridge! Great home features 3 bedrooms and an added bonus room or office off the family room. Formal living room with vaulted ceilings, formal dining room with french doors. Dining area in kitchen, family room features brick fireplace and hearth. All 3 bedrooms upstairs with ceiling fans. Master has a balcony so you can enjoy the sunsets in the evening! Laundry room. 3 car attached garage. Big yard with covered patio and water fountain. Great amenities with community pool, tennis courts and paseos. 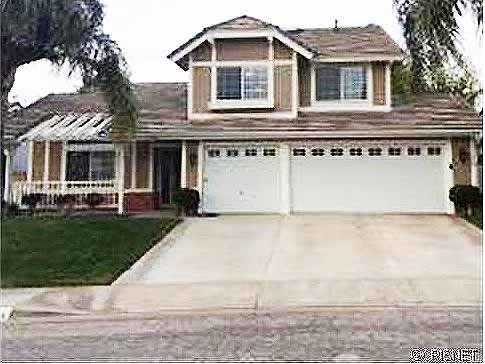 This home for sale at 27184 Highlands Lane, Valencia, CA, 91354 is located in the Valencia Northbridge neighborhood and the Ivywood tract. This is a short pay listing. Located off Hillsborough Parkway off Decoro, this lovely home has Northbridge community facilities and the HOA fee monthly is $40. Huge backyard and a balcony off the master bedroom.